As the audience waited in great anticipation for the 2 millionth visitor to enter DPAC last night, I quietly sat in my seat. I sat mesmerized by a smoke screen shielding the view of center stage; behind it was the colorful production of Joseph and the Amazing Technicolor Dreamcoat. As the 2 millionth visitor award was presented, I watched a lifeless smoke stack begin to take on recognizable shapes; shifting shapes from giant ships to trains to crayons. The journey through the biblical story of Joseph and his 11 jealous brothers begins with a simple alarm clock, jolting Joseph out of bed. 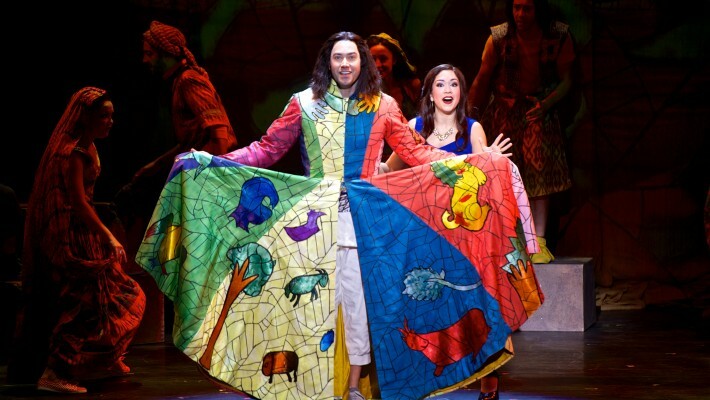 When I found out that the roles Joseph and The Narrator would be played by the husband and wife team of Ace Young and Diana DeGarmo I was anxious. I found solace in the thought that, “If their fellow American Idol alumni Clay Aiken, Fantasia, and Carrie Underwood can do Broadway…so can Ace and Diana.” I was half right, sorta kinda. Diana DeGarmo brings a high energy character to life on the stage, keeping us informed of the story through her narration and song. However, I do question the use of a handheld microphone for her character. Yes, it gave her a prop, but it reminded me of when she competed on American Idol. I wish she could have had both hands free to use to interact with the cast. All things considered, Diana DeGarmo is the anchor of the cast; she also carries the duo of leads onstage with a powerful personality, energetic smile, and phenomenal voice. Ace Young has his strengths and weaknesses; he is an amazing dancer, but only an average actor. That dichotomy made me question the casting of him as Joseph. He would have been able to “rock out” in one of the brother roles. It is easy to see him as the lead in Rock of Ages or maybe even Roger from Rent. That being said, I don’t believe Ace’s style of singing was what Sir Webber had in mind for Joseph. His voice was once described by, former American Idol judge, Simon Cowell as “nasal”. I have to agree, he voice sounded very nasal in all of the songs he performed. Andy Blankenbuehler takes the beautiful music from Andrew Lloyd Webber and lyrics of Tim Rice and creates a new production for the Broadway Tour. His directorial concept takes the Book of Genesis story from clothing of the biblical times to clothing of the modern age. Mix in some amazing Technicolor lighting, simple yet wesome moving set pieces and the journey is set. And thank you Andy for making the opening overture not boring and the curtain call the most amazing one I have ever experienced! It is impossible to write about the show without mentioning the high energy choreography. For the final number of Act 1, I felt that I was watching a high impact jazzercise video. I found myself I was waiting for Richard Simmons to prance on the stage to begin Sweatin’ to the Oldies. Heck, I wasn’t even on stage and I was out of breath and sweating from their routines! The words on this page will never be able to do justice to the set and lighting design. Such great detail was put into the backdrop. Much thought was put into the multiple uses of the muslin curtains hanging from the fly system. The quick transitions from one scene to the next were flawless and created beautiful scenes. Although the characters of the 11 brothers are inherently bad because of their actions in selling Joseph into slavery, I still I fell in love with each and every one of them. I wouldn’t mind if those cast members had a spin-off musical entitled 11 Cool Brothers and a Dude with a Coat. The contrasting styles of song that each brother brings are unique; the audience is left wanting to hear more of their tales. From back-woods country, to Parisian flair, to the Reggae beats; we witness the unique contrasting personalities that the family members possess. One of the fascinating things about seeing and performing in live theatre is the ability to escape reality, and Joseph helped create that parallel universe. Random singing, dancing, flashy costumes, and an Elvis sighting help me forget that I was sitting in Durham, NC and transplanted me to ancient Egypt. 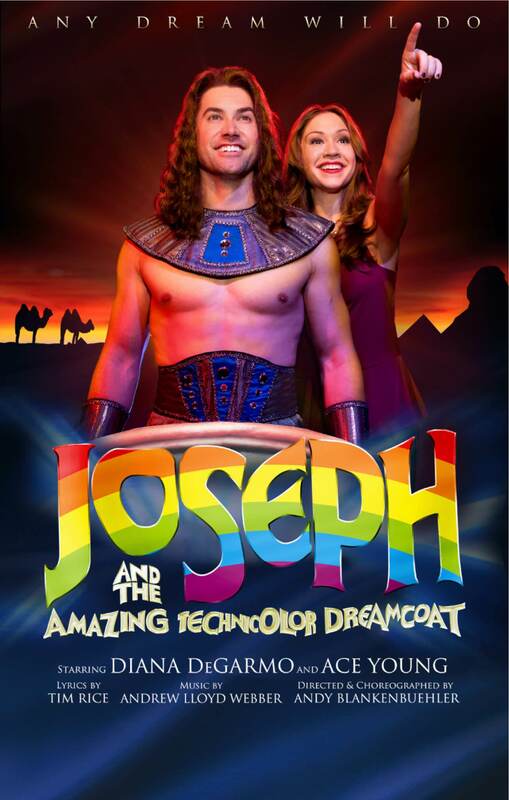 I’ve known the music, known the story, but had never experienced a live performance of Joseph and the amazing Technicolor Dreamcoat. I’m truly glad that I went and witnessed this Webber classic.